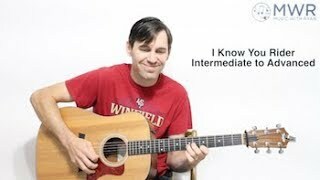 This lesson is for the old folk/blues tunes 'I Know You Rider' in the key of D. This tune was probably made most famous by 'The Grateful Dead.' I've created an intermediate to an advanced arrangement for this lesson full of hammer-ons, pull-offs, syncopation, and eighth note runs. We'll be using a wide range of the fretboard and I'll be talking about the scales I used to construct the solo. This tune is a lot of fun to play and this solo will provide lots of energy the next time you take your solo at the jam!